Sushi? Like… with the fish? Right. So being a rural Irish girl I naturally had a huge aversion to the idea of Sushi. Raw fish and all that. However, after a rather lovely post-quiz sushi evening on Wednesday last I am completely converted. It didn’t start off too well, and I figured okily dokily I’ll just stick to the veggie options. However my Sushi-experienced classmates thought differently and eventually I was convinced to try just an itty bitty bit of tuna, but confident that I would hate it (naturally). Ahem. I didn’t hate it. I actually maybe sorta liked it just a little. It didn’t actually taste like fish, like in that tinned strong-smelling tuna (which I do like but couldn’t think about eating raw tuna like that…) And so I tried some more. And I tried a bit of salmon. And decided that yes, in fact I did like this stuff. 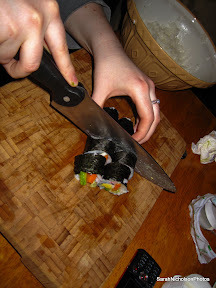 And then I had super mighty fun making a sushi roll with the aid of all-knowing classmates. So now I’m kinda hooked. So now, next step in process – ease family into the sushi era. Now, this is not going to be an easy process. There’s not a flying hope that they will actually eat a sushi roll straight up (aforementioned raw fish). Sooo I’m going to go with the less raw types of fish i.e. smoked salmon, cooked tiger prawns etc. I bought the sushi rice, the nori, the rice vinegar, got the mat to roll it. I have some avocados, asparagus, carrot, cucumber on standby, aaaaaand I have invested in a rice cooker, so it’s all set to go… just as soon as I’m better. “ease the family into the sushi era”…can i hold you to that? Loving the pics.is it weird to find raw fish attractive? !